When I originally wrote about that question, it seemed rather straight forward. Life seems to have a mind of its own. Last night, three of us contemplated that question and others as we joined together for what we’re calling Juntos Salon … juntos being the Spanish word for "together." My reading for the evening was the blog post which introduced the question. One of my friends responded that we’re already creating the life we want. Her meaning was if we wanted a different life, we would be doing things differently. Therefore, this must be the life we want. All my bells and whistles started chiming … but … but … but! All three of us are writer/artists. The pieces we read circled around living life as artists, living lives of choice and creativity. We are each single, older women who have chosen to move to Mexico within the past year, leaving friends, family and our familiar worlds behind. We are making our art, actively living a life we’ve chosen, and grateful for the opportunity to live in this vibrant village in a country that has captured our hearts. And, yet. And, yet, some mornings I find myself mired in Facebook. Don’t get me wrong; I love Facebook and I honor the service it does the world … for free! However, I want Facebook in my life like salt, not as a main entree, yet I find myself checking the number of likes on a post, feeling compelled to acknowledge the posts of others, and responding to the many dramatic announcements related to the endlessly ongoing flood of politics. According to my friend, this is what I’m doing; therefore, it is the life I’m choosing, the life I want. She’s right, of course. If I truly wanted a different life, I would do things differently. There really isn’t any wiggle room. As Yoda says: there is no “try.” There is only do or don’t do. It seems like a whole lot of creating the life we want comes down to articulating what we want, which means being okay with “wanting.” In our culture, asking what we “want” seems to spark answers that are primarily material: houses, cars, clothes; or status: achievements, titles, certificates, memberships, and so on. Wanting is also tied together with a sense of lack. Since I want something, it must mean I feel incomplete without it. Wanting appears to be in conflict with the spiritual belief that we have enough, that we are enough, that everything is perfect. There is general agreement that wanting is driven by ego. So, is wanting to live a creative life just another aspect of the ego? When I thought of all the “doing” involved in that definition of living life as an artist, I began to wonder if I were asking the wrong question. Another reading from last night’s salon was about reframing our trials and tribulations and recognizing them as perfect situations for helping us achieve our purpose of life. My friend said she was here in this lifetime to explore love and wrote about reframing her story as one that has given her the experiences necessary to help her truly understand love. I could feel my nerves tingle in alignment as I recognized that I was still looking for that clear statement of purpose for my life. 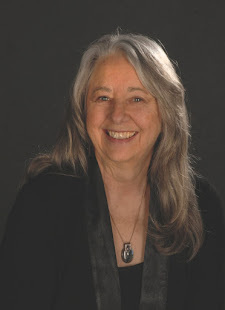 I have long told my story as one of disconnection and aloneness but this morning I realized I could replaced those descriptors with the idea of “solitude.” Suddenly, I recognized the amazing gift of time I was given, not only as a child, but also now in my later years. As I thought about my journey, what brought it all into focus was the idea that my life purpose is the development of my personal consciousness, my true-self rather than my ego-self. When this whole line of thinking began, I defined the life that I wanted to create as one of learning and growth and being immersed in art and beauty. That sounds good. However, if my life purpose is developing my true-self, it leads to a broader definition, one less about doing and more about being. And, all of that led me back to thinking about the place of art in my life. The piece the third member of our little salon read compared an art class to life. She is taking a watercolor class where the instructor forbids using black, brown or gray. However, outside of class, she had done both a gray-tone study and a color study and brought both of them with her to our salon. Her reading explored how both of them had helped her see more clearly about herself and the world around her. We talked a lot about the *dark* aspects of life that help us appreciate the radiant colors. As each of these readings built on and deepened the others, more thoughts began to churn about the original question and my responses to it. I realized the deep dive into photo artistry that I’ve been doing for the past two months has excited and thrilled me, focusing me on my life as an artist. When I thought about the original question: What is keeping me from creating art every day? my answer was only about art and the making of it. 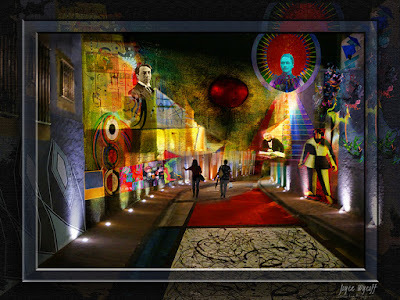 Now I realize that art is one of the joys of my life, but it is not the purpose of my life. Maybe there's a different question. When I changed the question to “What will help me further develop my personal consciousness, my true-self?” it was like shining a beacon onto my path. The word that showed in the dim light was “Accept” ... accept that life is perfect, giving me the experiences I need. Accept whatever is and be present with it. Accept Life. This pricked me with dissatisfaction. 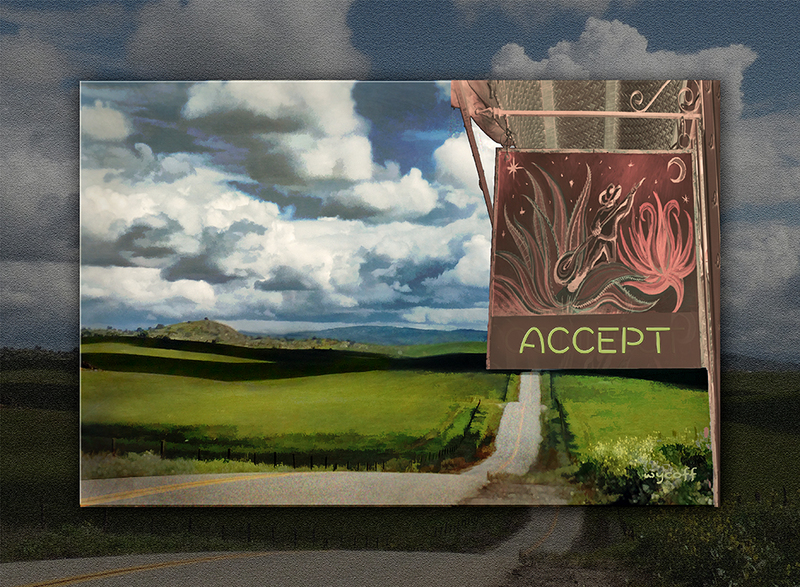 Accepting is not doing. I wanted something to do, a list, a project, a goal. I wanted something to *want. * Twenty-five years ago, I took a class that had the concepts of “doing” and “being” at its core. It befuddled me. I am a doer. I have a lot of energy for doing things, making art, rearranging cupboards, writing blog posts. Does accepting mean not doing? Accept the results of that joy. My guess is there will be more. All of this lead to the image above which developed from a photo taken on a spring day on one of the back roads of the Sierra foothills. 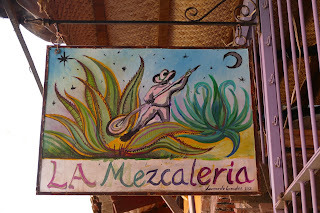 The manipulated sign came from travels in Mexico, taken because I collect words and signs that end in -eria, designating businesses of different types. 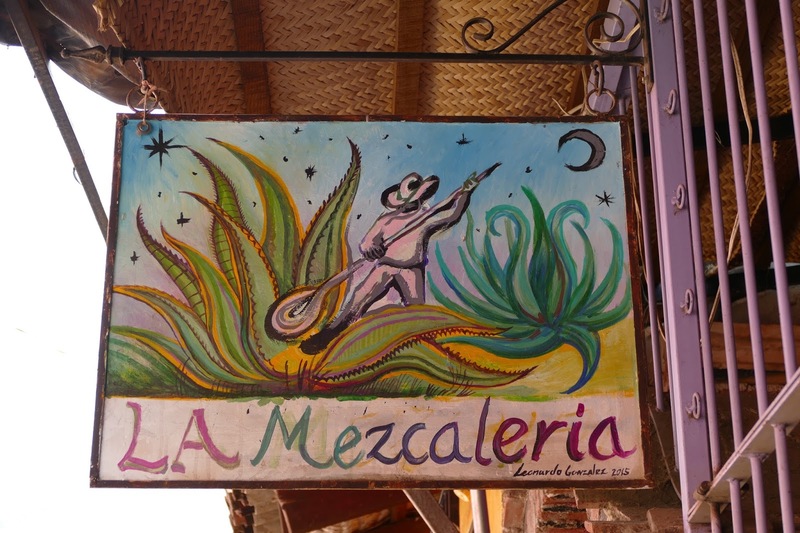 This one originally said, “La Mezcaleria,” as in a place that sells mescal. I am struck by the varying rose colors in the letters of "Everyday Beauty", which picks up the rose color of the outer petals of the filmy almost diaphanous flowers. The dark background with its hint of mysterious shine makes the letters and flowers pop out. The mystery seems to reside in how the light is nearly absent behind, and yet, is cast on the flowers and treetrunk. My eye is drawn across the banner art to the light falling on the gorgeously warm-looking bark, and finally to the perfect shadow of the flower on the trunk, awaiting my discovery. As for the newest digital art above, the Message from the Road, it feels satisfying, engendering in me a big Ahh, on lots of levels. thanks for doing what you do. Susa ... thanks for noticing so much and being so kind. juntos! I need to ponder this post and share it... Thank you for putting into words what I've felt many times. Being vs. doing. The challenge of that, and the beauty it presents. "We go through life making who we are. Choice is the hand that shapes the raw clay of a person." Thanks, Hugh. I like that quote.